Netflix has released new Armistead Maupin’s Tales of the City first look photos, featuring Ellen Page, Laura Linney, Olympia Dukakis, Charlie Barnett, Zosia Mamet, and Murray Bartlett. Check out the photos for the upcoming limited series in the gallery below! Inspired by the books by Armistead Maupin, this next chapter — Armistead Maupin’s Tales of the City — follows Mary Ann (Laura Linney), who returns home to San Francisco and is reunited with her daughter (Ellen Page) and ex-husband Brian, twenty years after leaving them behind to pursue her career. Fleeing the midlife crisis that her picture-perfect Connecticut life created, Mary Ann returns home to her chosen family and will quickly be drawn back into the orbit of Anna Madrigal (Olympia Dukakis) and the residents of 28 Barbary Lane. The cast includes Academy Award nominee and Emmy, SAG and Golden Globe Award-winning actress Laura Linney and Academy Award and Golden Globe winner Olympia Dukakis reprising their roles as Mary Ann Singleton and Anna Madrigal. Academy Award, BAFTA, Golden Globe, and SAG Award nominee Ellen Page joins the cast as Shawna. Barbara Garrick returns as DeDe Halycon Day. Series regulars also include Paul Gross (Due South, Alias Grace) reprising his role as Brian Hawkins, ex-husband of Mary Ann Singleton (played by Laura Linney) and father of Shawna Hawkins (played by Ellen Page); Murray Bartlett (Looking) playing the lovable Michael “Mouse” Tolliver, a longtime resident at Barbary Lane and Mary Ann’s best friend; Charlie Barnett (Chicago Fire) playing Mouse’s boyfriend Ben Marshall; newcomers Josiah Victoria Garcia playing the role of Jake Rodriguez, a newer resident on Barbary Lane who is a transgender man and a caregiver for Anna Madrigal (played by Olympia Dukakis) and May Hong (High Maintenance) as Jake’s long-term girlfriend Margot Park. Among the talented roster of recurring cast members are: Jen Richards (Her Story) playing a young Anna Madrigal, Daniela Vega (A Fantastic Woman) as Ysela, a trans woman who plays a pivotal role in Anna’s life; Michelle Buteau (First Wives Club) as Wren, Brian’s no-nonsense best friend; Ashley Park (Broadway’s Mean Girls) and Christopher Larkin (The 100) as twins Ani and Raven who are newer residents of Barbary Lane; Caldwell Tidicue aka “Bob the Drag Queen” (RuPaul’s Drag Race) as Ida Best, the manager of a burlesque club where Shawna and Margot work; Matthew Risch (Modern Family, Looking) as Mouse’s ex-boyfriend Harrison; Michael Park (Dear Evan Hansen) as Mary Ann’s husband Robert; Dickie Hearts (Grace & Frankie) as Mateo, DeDe’s housekeeper; Benjamin Thys (The Meyerowitz Stories) and Samantha Soule (Godless) as a queer polyamorous married couple Eli and Inka; and Juan Castano (The OA) as Ben’s co-worker Flaco Ramirez. Currently in production, the series spotlights LGBTQ people both in front of and behind the camera. Showrunner / Executive Producer and writer Lauren Morelli (Co-Executive Producer and writer Orange Is the New Black) and Producing Director and Executive Producer Alan Poul (Tales of the City, Six Feet Under, The Newsroom), who are both part of the LGBTQ community, assembled an entirely queer writing team comprised of Andy Parker, Patricia Resnick, Marcus Gardley, Jen Silverman, Hansol Jung and Thomas Page McBee to create the authentic and multigenerational LGBTQ characters and stories. Talented directors who are also part of the LGBTQ community including Silas Howard, Sydney Freeland, Stacie Passon and Kyle Alvarez bring the vibrant, warm and colorful world of Barbary Lane to life. Transgender people involved in the production include: Josiah Victoria Garcia (Jake) a non-binary trans actor who uses they/them pronouns; Jen Richards (young Anna Madrigal) a trans woman who starred in and was a writer and producer on the Emmy-nominated web series Her Story, about dating as a trans woman; Daniela Vega (Ysela) a trans woman and the lead of the Academy Award-winning film A Fantastic Woman; writer Thomas Page McBee; and directors Silas Howard and Sydney Freeland. 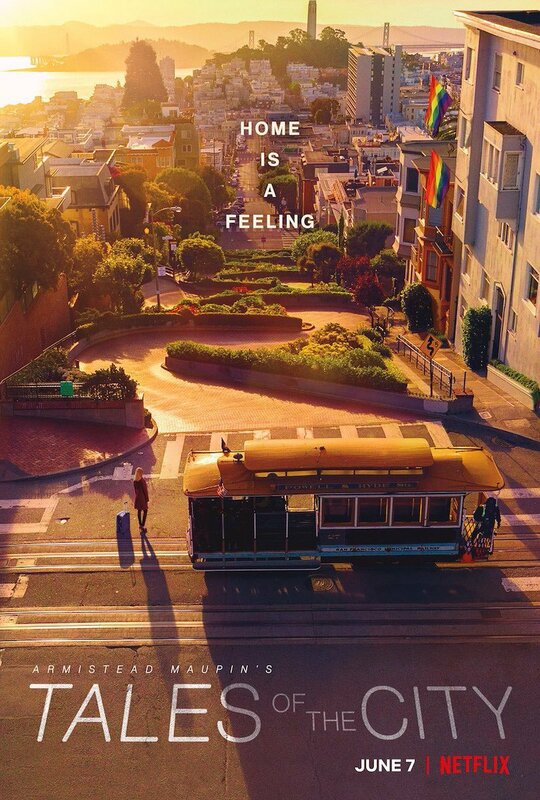 Armistead Maupin’s Tales of the City is a Working Title Television and NBCUniversal International studios production for Netflix. Armistead Maupin and Laura Linney executive produce along with Morelli and Poul. Additionally, Working Title’s Andrew Stearn, Liza Chasin, Tim Bevan, and Eric Fellner also executive produce. Michael Cunningham, author of the Pulitzer Prize-winning novel The Hours, serves as a consulting producer. Poul served as Producer on the original Tales of the City, and Executive Producer on More Tales of the City and Further Tales of the City, which earned a Peabody Award and multiple Emmy Award nominations. The 10-part Netflix original limited series will debut this year.